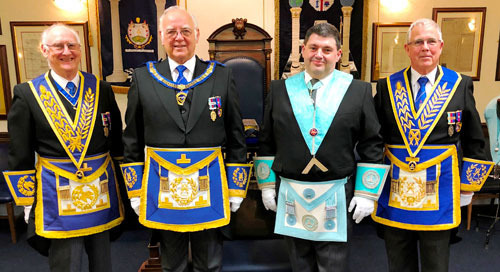 David Ogden (Assistant Provincial Grand Master) was the honoured guest at Pemberton Masonic Hall to attend the installation of Tuscan Oak and Lambert Head Lodge No 6387, and was accompanied by fellow grand officers including Past Assistant Provincial Grand Master Stanley Martland together with group chairman Geoffrey Porter. David Ogden (left) congratulates the proclaimed WM Alex Hammond. Also in attendance were two acting Provincial grand officers, Chris Maloney and Eric Bailey, both very familiar faces now at special events within the group. Adding to the distinguished guests was group secretary Chris Reeman. 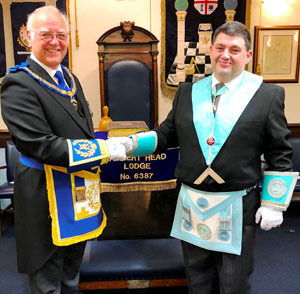 It was a return visit for David, who, only six months earlier, had attended to preside over the golden jubilee celebration of Ben Wilson’s 50 years in Masonry. David was not to witness the ‘normal’ installation ceremony, as Alex Hammond, the current master, was proclaimed as WM for another year. The lodge has had its difficulties recently, with ill health and circumstances conspiring against it, but with many brethren in attendance to support the retained master and assist where necessary, the night went smoothly. Everyone involved did a splendid job, particularly DCs Paul Ledson and Alex Humphry who performed in their own inimitable ways. There are no specific guidelines for a proclamation, and it requires guidance and innovation to make it special. Once completed, David was pleased to bring the greetings and best wishes of the Provincial Grand Master Tony Harrison to all the brethren and he hoped they would all have a healthy and happy year to come. Donations for the Pemberton Masonic Hall and the MCF 2021 Festival were presented to David who thanked the Master and brethren for their generosity. Pictured from left to right, are: Ray Martland, David Ogden, Alex Hammond and Geoffrey Porter. A lively and very friendly festive board was enjoyed in good spirits by all present. In his response to the toast to his health David reminded the brethren of the importance of the Royal Arch, the need to look after the hall, which, he was most pleased to say, the brethren of this lodge were fully committed to. He also urged support the MCF 2021 Festival, including the various fundraising initiatives such as the upcoming event at the Opera House in Blackpool, the ‘Night with the Stars Variety Show’. David also urged the brethren to support the Provincial Grand Master by attending Provincial Grand Lodge in Blackpool. Two brethren of the lodge, Geoffrey Hardman and Roy Tague, were to receive a promotion and David urged their friends to accompany them to the Winter Gardens and stay to enjoy the banquet afterwards in the company of the PrGM, the senior members of the Province and of course the group officers. The guests were informed that the group had arranged for a coach to take brethren to Blackpool and return them after the banquet. There was also the choice of sharing time with others attending over a full breakfast at Ashton Masonic Hall before boarding the coach. It was a peculiar moment when the organist, Keith Magraw, well-practiced in his duties, having moved in preparation before the toast to the health of the WM, was sitting at the piano, ready to strike up the music for the master’s song, only to find no-one was there to sing. The WM, having responded to the toast to his health and drawn the winning tickets for the raffle, called on the tyler for the final toast of the evening. It was fitting that it was Ben Wilson, the celebrant in September, who delivered that toast and the brethren rose to honour it. Prior to his leaving, the APrGM was presented by WM Alex with a suitable gift to aid in preventing the cold damp weather from affecting the chest perhaps – a famous bottle of the Scottish medicinal water variety. A splendid time was had by all. Pictured from left to right, are: Eric Bailey, Chris Reeman, Ray Martland, David Ogden, Alex Hammond, Geoffrey Porter, Chris Maloney and Alex Humphrey.